2004 Harley Roadking Motorcycle - $11,00088 ci10,500 mis one ownerMustang seats, detachable sissy bar, wild pig slip on pipes leather Harley bags.Will come with quick detachable windshield, detachable luggage rack, original seats and a set of hard bags that match the bike.No trades please!Questions or for more pics call or text 479-675-XXXXThank you! 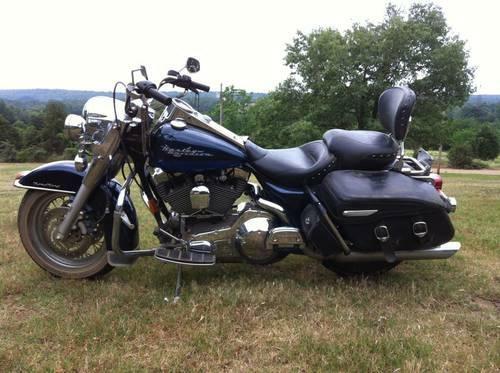 2004 Harley Davidson Roadking with Extras is a 2004 Harley-Davidson Road King Motorcycle in Booneville AR. Find other listings by searching for 2004 Harley-Davidson Road King in Fort Smith on Oodle Classifieds.